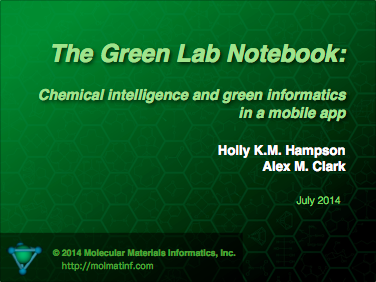 Slides for a talk about the upcoming Green Lab Notebook (GLN) app, which was presented this morning at the International Conference on Chemistry Education (ICCE2014) in Toronto. The short presentation describes how the field of green chemistry can be brought closer to both students and professional chemists with the assistance of an accessible and easy to use mobile app. The presentation was given by Holly Hampson, since I’m currently situated much further away from the event.